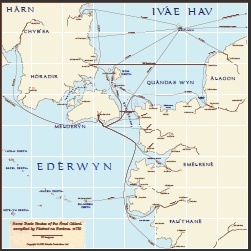 The Émel Gálani (Middle Straits) are the waters between the isle of Hârn and the Lýthian mainland. At their narrowest point, they are just 12 and 1/2 leagues across. Numerous ships ply the routes through the straits, many connecting the port of Chèrafîr on the Hârnic isle of Mèlderýn to those on the mainland. Others pass between the coastal ports of Álagon, Emélrenè and Palíthanè, and beyond to locations farther north and south. The renowned loremaster Fástred of Beréma has produced numerous charts used by the wealthier pilots and ship captains of the region. Two versions of Master Fástred's charts are provided here: an ordinary or mundane version, which shows a selection of trade routes all at once, and a much more rare example which shows only those routes that the owner wishes to view at any given time. Only a very few of this second, magically endowed chart are in use.